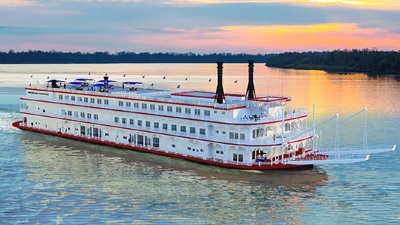 With four decks and 123 comfortable staterooms, the American Countess is your home away from home on America’s heartland rivers. This paddle wheeler was built upon an existing hull in an extensive project that lengthened the boat by 60 feet. Cabins are sleek and modern, and many have private balconies or open out onto the deck. The culinary team takes advantage of the region’s bounty of fresh ingredients to create dishes for the Grand Dining Room and the more casual River Grill. Guests can take in a show in the theater, work out in the fitness center or mingle with fellow passengers in the card room.